The aim of the events are to stimulate a regional conversation about how we can achieve the 3 principles of a sustainable economy bringing the voices of academics, funders, innovators, SMEs and corporates to the debate. 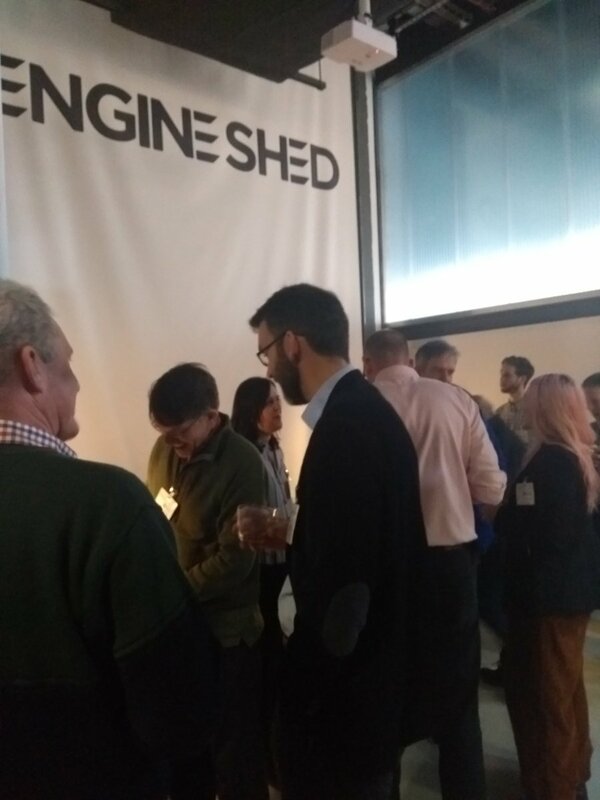 The first event in the series was held on Wednesday 3rd April and attendees joined expert speakers and the STBAH team at the Engine Shed in Bristol for the topic of Designing out Waste and Pollution. Professor Tim Ibell from the Department of Architecture and Civil Engineering at the University of Bath kicked off the event with his keynote, Enough is Enough: Material waste in building design. Operational Energy; how we light, cool and heat buildings, if we use existing technologies we will not reduce carbon emissions enough - some projects are just Eco bling. Material efficiency; We are wasting 60% of concrete in buildings, we do it because it’s easy to build. Looking at “appropriate structures” we take wet concrete and pour it into fabric.. it moves naturally in the fabric, and gives us the correct shape and efficiency. Prof Tim Ibell highlights that only 40% of the concrete in buildings is actually working, during his keynote talk at the STBAH Designing out waste and pollution event. Jamie O’Hare a Sustainable Design & Innovation Specialist then went onto to talk about strategic innovation for sustainability. Jamie talked about needing to look at the life cycle of a product, such as, would a shrink wrapped cucumber always be worse than a naked one - not when you consider shelf life. When is a plastic bottle more ecological than steel reusable - when on a flight and extra weight cancels out benefits. Jamie got the audience thinking, with some interesting questions on sustainable choices as part of his talk. Jamie then went on to discuss the need for new business models, as existing models allow only incremental changes, for example, the wrong incentives in business models… cheaper to replace dishwashers than repair. This was a very thought provoking talk and led to a highly engaging conversation in the room. Attendees and speakers network and engage following very thought provoking keynotes at the STBAH Designing out Waste and Pollution event. Following a short break there were flash presentations from two local start ups who are receiving business support through the sustainable technologies business acceleration hub. Each of these start ups are currently scaling up their businesses and innovating in low carbon sustainable products and services. First up was Adaptavate who are rethinking and redesigning the way building materials are produced, used and disposed of. They are innovating and designing low-carbon construction products for healthy buildings and inhabitants which help ensure the longevity of our fragile ecosystem whilst surpassing the performance of market leading products. Next up was Qualis Flow, who are creating smarter cities - by using technology they are helping businesses manage their environmental resources more sustainably on construction and development sites. Their environmental management platform can holistically track, monitor, and predict project environmental risk. Qualis Flow allows projects to have complete oversight of their environmental performance in real-time. Qualis Flow is a digital environmental management system and sustainability tool. The mornings event was rounded off with the opportunity to network and the room was filled with a buzz from those keen to chat with the keynote speakers and plenty of questions for the two innovating start up companies. It was also an opportunity for attendees to learn more about the bespoke free business support available through the Sustainable Technologies Business Acceleration Hub and make an application to join the programme. The next breakfast event in the series takes place on Thursday 27th June and the topic is focused on Keeping Products and Materials in Use. If you are an SME or start-up interested in reuse, repair, remanufacture or recycling, or new business models such as ‘access over ownership’ then this event is for you. You may have a product, service or innovation in one of these areas or may simply be curious about how you get your business ‘in shape’ to contribute to a sustainable economy? The Sustainable Technologies Business Acceleration Hub is part funded by the European Regional Development Fund to support start-up and existing sustainable technology and low carbon businesses. The project will establish and scale-up over 130 small and medium enterprises (SMEs) over the next three years within the low carbon and sustainable technology fields. The aim is to help these businesses grow, innovate and establish lasting research partnerships with the University of Bath, generating economic growth in the region and delivering on the Government’s Industry Strategy.